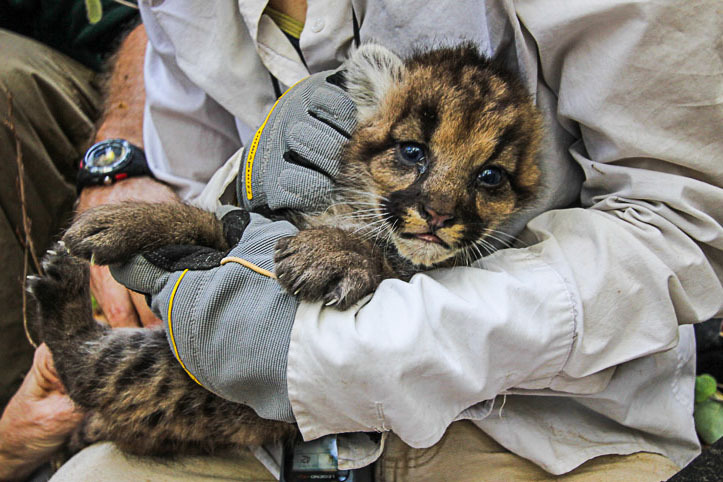 Since the Santa Cruz puma study started in 2008 our research has focused on adult pumas. Sure, we’ve taken cute photos of kittens to post on our blog (because those blue-eyed, dark-spotted, shaky-kneed kittens are just about the cutest things on 4 legs! ), but from a research standpoint we haven’t focused much on them besides knowing how many kittens a female has given birth to and considering how that affects how often she needs to hunt, how she moves through her territory, and mating behaviors of females and males. And, there are some very real questions about how many kittens survive to adulthood and how they disperse from their mother’s territory to find their own adult territories that have importance for understanding pumas in the Santa Cruz Mountains. Puma 7F – who was first collared on May 22, 2009 and is now the longest-studied and oldest pumas in our project – stopped her regular movements through her territory on July 22 of this year. Instead of moving regularly through her range and periodically making kills, she stopped in one place for several days in a row, and when she’d leave for an overnight journey she’d return back to the same spot by dawn. Pumas generally do this for only one reason – because there are kittens that have been born and need tending. 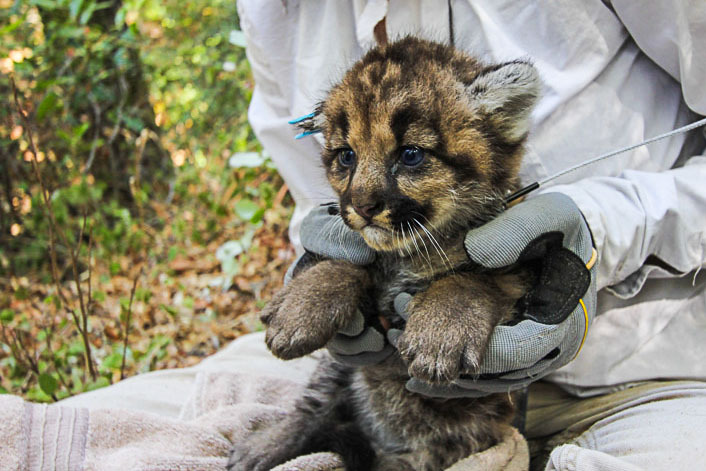 Yesterday morning, Veronica, Yiwei, myself, and 3 personnel from California Department of Fish & Wildlife visited the site and, in a dry streambed among oak trees, found a single, 4-week-old puma kitten and fitted her with a tiny handmade tracking collar and added her to our study as Puma 40F. The neck band on the tiny collar will expand incrementally as she ages and the tracking device will enable us to see how long she survives, how often she and her mother are together as she ages and her skills and competencies change, and then recapture her before she’s fully grown to chart her dispersal process with an adult gps tracking collar.